What do you get when you put in a wireless transmitter/receiver device, a computer, a global positioning system receiver, a camera and a video camera together? Well, you get the new mobile phone. The convergence of various electronic devices, which did not hitherto interact with each other, and the miniaturisation of the gadget are well demonstrated in mobile phones, so much that today’s advanced mobile phone is a scaled-down Personal Computer (PC), just as the PC is in itself a miniaturised mainframe of the mid-1960s. Not just a device that only makes voice calls or sends/receives text messages; the mobile phone has become an ubiquitous lifestyle statement, and a must-have in today’s world. When the telecommunications protocol for mobile GSM phones was being formulated, no one could have foreseen that the Short Message Service (SMS), that allowed the sending of short text messages, would become such a killer application. Who could have predicted its popularity—in the year 2000 (17 billion SMS messages sent). The number rose up to 250 billion in 2001 and to 500 billion in 2004. Incidentally, Asians are SMS champions, followed by users in Europe, with the Americans far behind. After SMS came the MMS, which is Multimedia Message Service, a method that transmits graphics, video clips, sound files and short text messages over wireless networks. Pictures and video dominate MMS utilities and camera phones date back to the year 2000. So popular have these gadgets become that today it is hard to find a phone without a camera. People love to take photographs, and there has been such a spurt in picture-taking and sharing that there have been serious concerns about ensuring people’s privacy. In South Korea and Japan, all camera phones must make a clearly audible sound whenever a picture is taken. Many gyms, museums and dance clubs ban their patrons from using camera phones. In fact, in 2004, Saudi Arabia banned camera phones for a few years, till it realised that the ban was impracticable. Video-phones are the next step, and now practically all camera phones are video phones. Although the quality of shots taken by such phones is not too good as of now, concern about their possible misuse has multiplied. However, by the year 2008, it is expected that over 1 billion camera phones will be sold worldwide, and they will all shoot video. E-mail over mobile phones is now old news, but it was a revolution when it happened. Most of the new smart phones have typewriter-like keyboards that give users an easy way to input data, long a bugbear of mobile phones. Talking of smart phones, many have a Global Positioning Service (GPS) receiver integrated in them. You can download maps and use them, along with other services that provide information about the area you are in, say the nearest restaurants and their ratings, police stations etc. Of course, one of the earliest casualties of smart phones was the palmtop organisers — Palm and Psion. Now all your contact and calendar details can be in your phone, and who wants to carry another electronic organiser. In fact, Palm itself makes the Treo line of phones, which is a convenient marriage of these functions. However, Apple’s iPhone has generated the maximum hype. What is it? A mobile phone, a widescreen iPod with touch controls, and an Internet communications device with desktop-class email, web browsing, maps, and searching —all in one small and lightweight, handheld device. Other manufactures are too in the race and you can expect a slew of new products. 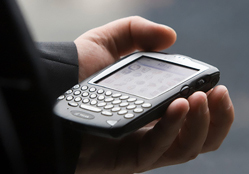 This is mobile convergence at its best, a multi-function device that gives the consumer best picks from the world of telecommunications and computers.